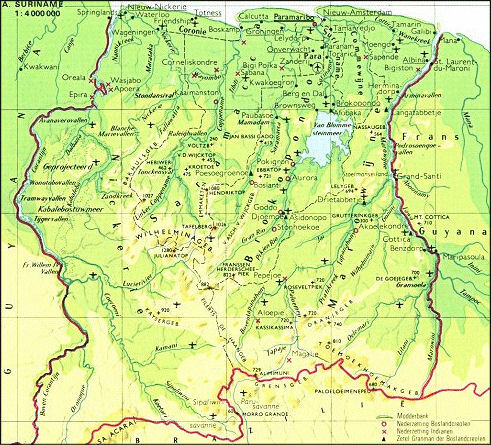 Suriname (Surinam) is located on the northeast coast of South America; just north of the Amazon Delta, between 2 - 6 degrees latitude north and 54 - 58 degrees longitude west. The climate is tropical with an average temperature of 82.5� F. (28� C.); there are two rainy- and two dry seasons. There is a high relative humidity of air (80 - to 90 %) and an absence of hurricanes. 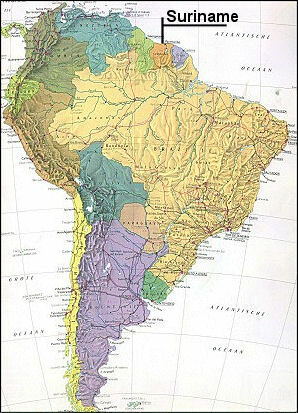 The country has a surface area of 63,064 square miles (164,000 square kilometers). The capital Paramaribo sparkles like a jewel on the broad Suriname River and the fabulous climate sets the stage for a lot of outdoor activities year round! Suriname is an independent nation with a multi-cultural population of Africans, Amerindians, Chinese, Creoles, Dutchmen, East Indians, Indonesians, Jews and Lebanese. In spite of the differences in heritage, the Surinamese are a model of racial - and religious harmony. Since Suriname is located right in the Amazon, nature has always been close by. The Republic of Suriname is one of the largest producers of alumina - and aluminum in the world thanks to the existence of very large deposits of bauxite as raw material and hydro power potential. There are many rivers and a largely uncultivated tropical rainforest, rich in trees and exotic plants covering more than 94.7% of the land mass. This makes Suriname is percentage-wise the most forested country in the world! The nation's topography is part of the geographical formation known as the Guiana Shield, a mineral-dense layer of the earth's crust estimated to be two billion years old and a contributing factor to the existence of large deposits of gold. Gold, timber and oil are the country's most important export products. The most important agricultural export products are rice, bananas and vegetables. Due to the abundance and variety of fish and shrimp, deep sea fishing is exercised extensively. The flat coastal region, the most inhabited part of the country, is the agricultural area. South of this region, the landscape changes into savannas, where the soil is mostly sandy and one can enjoy an undisturbed view at starry skies at night. Hereafter are the undulating hills and mountains, densely covered with rain-forest. Here there is an abundance of flora and fauna, whereas numerous species are endemic to Suriname. The rain-forest is home to more plant species, animals and insects than anywhere in the world. Suriname has many nature reserves and parks within its borders. In the protected habitat are a great variety of plant species, flowers, insects, amphibians and animals including the jaguar, puma and other big cats. These reserves and parks are the crown jewels of the natural exertions, a plant lover's paradise and a scenic land adventure. Wilderness lovers can hike on guided expeditions, enjoy the camping life or take a tour on one of the many rivers, crossing the country. Canoeing, climbing, white - water rafting, trekking and bird watching are only some of the many other possibilities. For 360 degree panoramas of Surinam go to: Suriname360. In the heartland of the country is the rugged beauty of the Central Suriname Nature Reserve with a surface area of about 1.6 million ha, the largest in the world. Opportunity and something amazing waits around every corner in this country; from the Atlantic coast in the north, to the mountains bordering Brazil in the south; Suriname's natural endowments are overwhelming. While relatively small in size, it ranks 17th on The World Bank's list of wealthiest countries in the world in terms of natural resources. According to many visitors; "only the sky is the limit in Suriname"! 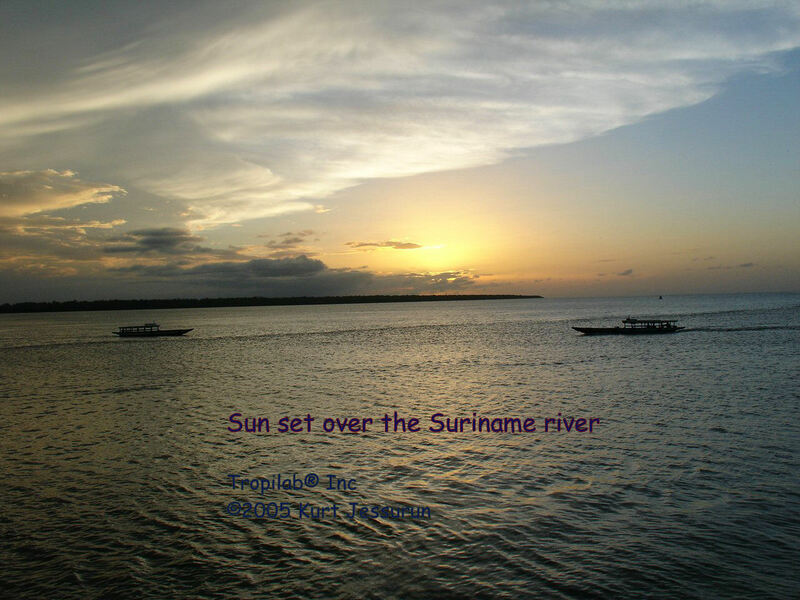 Also visit Suriname Travel Guide.